I stripped my diapers with it the very next day. And wow it worked great. Better than Dawn with far less rinsing afterwards. So then I was on a mission to find where I could get it wholesale so I could stock it in the store. I had already been asked to do so by a few loyal customers. Finally I got some in stock and I decided as it had been a couple of months since I had done that stripping with the RLR I would do ALL of my diapers. They were getting that ammonia smell when I opened his pail, so it was time. Well it is at this point we find out just how many diapers Braden has, THREE loads worth! So there I was with my friend Ashley (who also cloth diapers), hanging over the washing machine, taking photos for you all. My husband was looking at us like we were mad women the way we were clucking over the washing machine. Braden has been wearing said diapers for the last week, since I did the RLR strip and they all smell great again. No more ammonia smell when I open the pail. So here is what I did. Note that I have a top loading machine, but my friend Heather has a front loading machine and RLR works for her too. 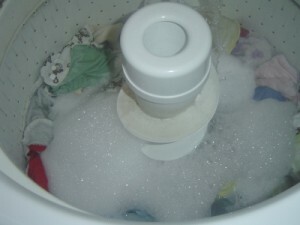 The suds as the machine filled up with warm water. RLR is in there already. 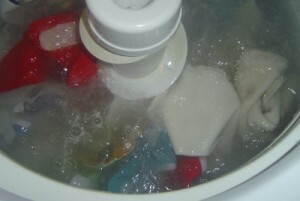 I rinsed the diapers on cold first, to remove any poop debris, wash away the pee etc. I filled the machine with warm water. While it was filling I added a whole packet of RLR. At this point I observed a bit of bubbling up as the machine was filling. I left the lid up on my machine. My machine does not drain the water unless the lid is down. I watched it agitate a heap of scum and suds to the top. I was thinking OMG, this is going to take a huge amount of rinses to get rid of all of these suds! I let it soak for around an hour or so before lowering the lid and letting the machine finish its cycle, which was a cold rinse. 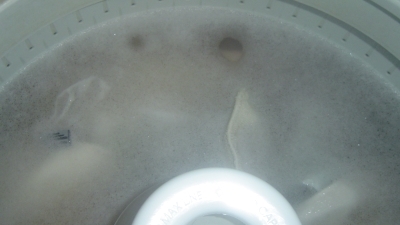 I did note that the suds did settle while I let it soak, but the water was a gray murky colour. The machine is agitating with its first warm water load. The suds are so thick you can barely see the diapers! 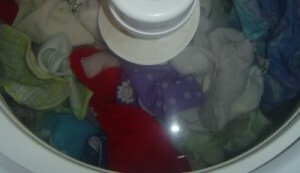 This is what it looked like after the diapers had soaked for an hour. The suds had settled but the water was gray! The second cycle, there were far less suds. I ran the machine again on a hot cycle. 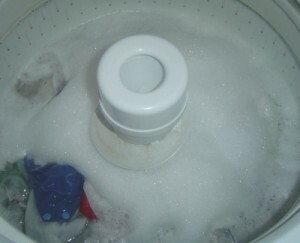 I left the lid up because I wanted to check the status of the suds. And I was amazed, because the huge suds had rinsed away in the previous cycle, and there was only a little bit of suds left. My machine does a cold rinse with its hot cycle. It was done. It was winter, so I had to run the diapers through the dryer. But if it was summer, I would have hung them out in the sun. In conclusion, this is not the cheapest way to strip the diapers, Dawn is much cheaper. However, it seems to me to be the most effective. So if you have bad stinkies, then this is worth trying. The final rinse. The water is clear!